Blake Griffin has transformed himself from a dunking human highlight reel into one of the league’s best all-around players. The development of his jump shot has made him nearly unguardable. And when Chris Paul went down last year, Griffin thrived for the Clippers, earning 3rd place in MVP voting. LaMarcus Aldridge is a matchup nightmare for any team. Most players who are quick enough to keep up with him have no chance at bothering his shot, a major problem since he is an elite midrange jump shooter. And those that are big enough to contest his jumper are not quick enough to keep up with him. He led his Blazers past a tough Rockets team in last year’s playoffs and is poised for another great season. While all three All-Stars have very different repertoires, they all have one thing in common this year: they are shooting farther from the hoop. Though Love, Griffin, and Aldridge have only played two games each, it is obvious that their shot selection tendencies have changed. In the 2012-13 season, Aldridge took 40.7% of his shots from within 10 feet, a high figure for a power forward. But this is mainly due to the fact that he was playing center and shooting more from the low post. The following offseason, the Trail Blazers acquired the true center they always wanted when they traded for Robin Lopez, which allowed LA to move back to power forward for the 2013-14 season. As a result, he took less shots from down low and took more midrange jumpers. As a result, Aldridge’s field goal percentage dropped from 48.4% in 2012-13 to 45.8% in 2013-14. This makes sense, as the midrange jumper is clearly the lower percentage shot. However, it is still extremely impressive that Aldridge made 44.2% of his shots from 16 feet extended to the three-point line in 2013-14, especially considering 41.5% of his shots came from this range. Now Aldridge has taken it to another level to start the 2014-15 campaign. In his first two games, only 27% of his shots have come from within 10 feet. What’s even crazier is that Aldridge has taken 67.6% of his shots outside of 16 feet. And 10.8% of his shots have been threes (he’s 2 of 4 from downtown), which isn’t that big of a surprise since Coach Terry Stotts has been begging Aldridge to step out beyond the arc since he first took over the Trail Blazers. As a result, since the 2012-13 season, Aldridge’s average shot distance has risen from 11.7 to 12.5 to 15.5 feet. I doubt Aldridge will continue to shoot so many outside shots. Hopefully some of those 16-20 footers become 10-16 footers (especially considering he’s only taken 2 shots from 10-16 feet this season) and he gets a few more post-ups per game. But I really don’t mind Aldridge taking the three-pointer. It spreads the floor and creates even more driving lanes for Damian Lillard, Nicolas Batum, and Wesley Matthews. And it seems like he’s totally capable of making the shot. So far this year, we've seen a lot more jump shots and a lot less dunks from Griffin. More specifically, we're seeing a lot of shots from 16 feet to the three-point line. This is a result of two things. First, opposing teams like to match their center up with Griffin, as this makes life much more difficult for him in the paint. And now that Griffin has a jump shot he can count on, he is more than willing to fire the open 18 footer. In his two games, he has hit 43.8% of his jumpers from 16 feet to the three-point line, a figure that places him in the realm of LaMarcus Aldridge. It’s unlikely he’ll be able to continue at this pace, but don’t be shocked if he breaks the 40% mark. The second reason we've seen more of Blake on the perimeter is because he plays next to DeAndre Jordan, one of the worst shooters the league has ever seen. In order for DJ to have any effect on offense, he needs to be near the rim. And when Griffin is constantly posting up, the paint tends to get extremely crowded. Luckily, the development of Griffin's jumper has really cleared up the paint and created better spacing for the Clippers’ offense. I still expect Griffin’s attempts at the basket (0-3 feet) to rise. There is just no way one of the league’s best finishers isn’t going to get more looks near the rim. However, it is important to note that Griffin has been getting fouled a ton near the basket (fouls negate shot attempts on the stat sheet unless the shot is made). 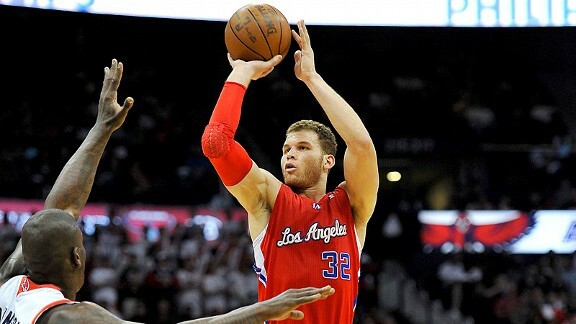 As an interesting side note, Blake Griffin also took two three-pointers against the Lakers and made them both. Don’t be surprised if Griffin starts taking some corner threes throughout the season, as his stroke has significantly improved from everywhere. Kevin Love is in the fortunate position of playing with the greatest player on Earth, LeBron James. However, it can be difficult for superstars to adjust to playing with each other. Just ask Chris Bosh. Bosh, who completely transformed as a player to complement James, recently stated K-Love will struggle to fit in next to the King. Kevin Love has already complained about not getting enough touches in the post, especially early in the game. And through two games, it is clear David Blatt has made an effort to get K-Love touches in the post early in the game. So it doesn't really seem like Love will lose post-up possession in Cleveland (this is also due to the fact that the Cavaliers lack any real low post scoring presence outside of Love and James). With that being said, Love will be asked to spot up and space the floor more rather than being used as a go-to-scorer. Love is playing with two elite perimeter players: James and Kyrie Irving. Both need the ball in their hands and will look to penetrate defenses. Thus, having Love linger around the three-point arc will draw big men out of the paint, giving James and Irving more room to operate. Expect the three ball to makeup around 40% of Love's shot attempts. There are only so many shots to go around for such a star-studded team, and I would be shocked if K-Love's attempt total doesn't fall. For a frame of reference, Chris Bosh's attempts per game fell from 16.5 to 13.7 in his first season with LeBron James. Love will probably take less midrange jumpers since the team would probably prefer him to catch and shoot from downtown rather than from 16-20 feet (also, Love is a pretty average midrange shooter). Ultimately, I think Love will be a perfect match for LeBron and the Cavs. I like that Love still gets touches down low, but he will also make a killing from long range with all the open looks he is bound to get on this team.